Despite U.S. pressure, China appears unwilling to expand dialogue with the United States on nuclear weapons. At a discussion at the Carnegie Endowment for International Peace on May 5, U.S. under secretary of state for arms control and international security, Rose Gottemoeller, pushed for more robust bilateral dialogue with China on nuclear weapons. Gottemoeller explained that China’s comprehensive program of military modernization – including nuclear modernization – necessitates deeper discussions. Gottemoeller explained that during the Cold War, mutually assured destruction (MAD) provided strategic stability (a state of equilibrium widely viewed as the least dangerous possible among nuclear powers). In the age of potential cyber warfare, prompt global strike, and missile defense, however, MAD is inadequate. The multiplication of potentially destabilizing technologies calls for more dialogue. 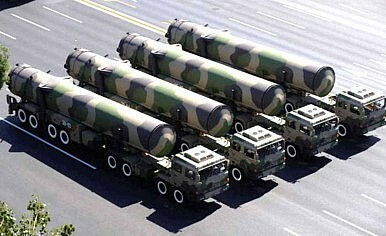 The U.S. Defense Department 2010 Nuclear Posture Review tasked the U.S. government with pursuing high-level nuclear discussions with both China and Russia. Despite a number of forums for discussing such issues (e.g. the Security and Economic Dialogue and various unofficial “track 2” events), it would seem there is no dedicated, official policy forum to discuss this important topic. During his visit to China in 2011, then-Defense Secretary Robert Gates’ suggestion of a dedicated strategic nuclear dialogue met with congenial aloofness. Gottemoeller’s words suggest that the United States is seeking such a forum, but China is resisting it. Senior U.S. nuclear strategist Linton Brooks noted the United States has a rich discussion with Russia and that it would be good to have such a dialogue with China. He also surmised that China is unwilling to engage in open dialogue because it believes the United States is after its nuclear secrets, a charge which Gottemoeller strenuously denied. Tsinghua professor Li Bin characterized China’s perspective as fearful that it is lagging behind in technology, limiting the effectiveness of its arsenal. Beijing is therefore investigating numerous technologies to mitigate this effect (for example decoy MIRVs). Li believes the intent of these efforts is to understand missile defense and other technologies, not to produce missile defense itself. Thus, China does not necessarily view its modernization efforts as affecting the nuclear equation, but rather as a means to stabilize the present balance of forces. Li described an academic debate within China as to whether Beijing should increase its nuclear stockpile. MIT professor Taylor Fravel and his coauthor Fiona Cunningham in a recent paper estimated that China would “modestly expand its arsenal, increase the sophistication of its forces, and allow limited ambiguity over its pledge not to use nuclear weapons first,” describing this ambiguity as increasing the risk of escalation during a crisis. I believe that having a dedicated dialogue is important for maintaining the open communication and transparency of intent needed to achieve strategic stability. This could come as a separate dialogue, although the most palatable route for China might be through quiet discussions on the sidelines of existing frameworks such as the S&ED (assuming this is not already the case). Fear of U.S. prying and the technology gap are convenient reasons for China to limit the depth of nuclear discussions with the United States, but are probably not the underlying reasons. I suspect that, despite the objections of some Chinese experts, there is both significant bureaucratic inertia as well as a belief in the utility of ambiguity mentioned by Fravel and Cunningham militating against greater openness. Unlike the debate over North Korea, in which the North’s supporters have had to cede some ground due to Pyongyang’s truculence, the issue of nuclear dialogues between the United States and China appears to be stalled.